Jack squished his wedding band the other day when he was sliding closed his closet door a little too fast so he used his hand as a bumper between the door and the door frame so it wouldn't make a big bang! and wake me up. He didn't realize he'd semi-flattened his ring until the end of the day when he finally took it off, his finger was hurting so badly; it took him until the next morning to piece together just how he'd done it. 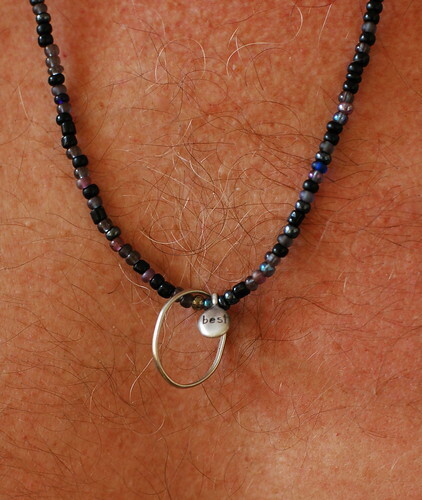 So, until he has time to get a jeweler he's just wearing the ring on a necklace I made for him last spring.